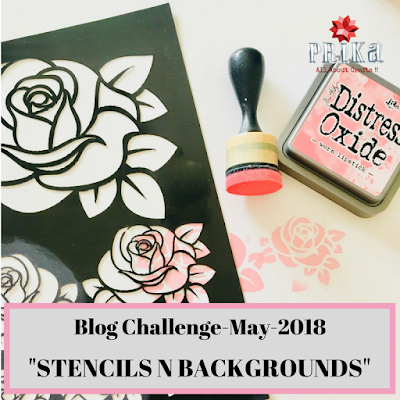 Hope you all having wonderful crafty days and nights…..We are here with new blog challenge for this month of May-2018, Trying out your hands on creating some wonderful backgrounds for your projects and using stencils to create some unique once…..We will be sharing few inspirations for creating the same from our own studio abnd hope to see you all getting inspired and sharing your projects with us. We are super excited to see all your creations for this challenge and new ideas…..This Challenge will be active from 15th May to 15th June 2018, considering late day of entering the challenge 10th of June and announcement of winner on 15th June, 2018. Don’t wait for last day to enter since it becomes very difficult for us to feature your entry on the blog before time and we really don't want to leave behind work of any talented crafter…..
After the project is published on the blog and other social media platforms like Facebook/ Instagram/ Twitter, share the post tagging us on your timeline.